This is a hair pin made from laying kingfisher bird feathers on silver metal. The technique and the beautiful blue fluorescent feathers were highly prized and sought after in 19th century China. Kingfishers are tiny birds and it takes a lot of skill to use their feathers in this manner. The technique, called tian-tsui, means dotting with kingfishers and involves adhering the feathers onto metal. This technique disappeared during the Chinese Revolution in the 1940s. It's a fabulous piece of history. 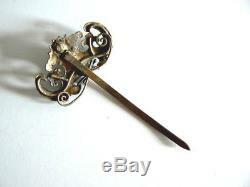 Head size: 1 1/2" wide x 1" long, 3 long with pin. 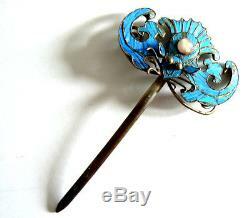 The item "Qing Dynasty Kingfisher Feather Hair Pin Antique VINTAGE Blue Chinese Ca. 1850" is in sale since Sunday, December 31, 2017. This item is in the category "Antiques\Asian Antiques\China\Other Chinese Antiques". The seller is "pablosalon" and is located in California. This item can be shipped worldwide.